Whether you eat three square meals a day or six well-rounded ones, chances are you throw in a snack every now and then. I like my afternoon string cheese and nectarine combo, but that gets boring. Check out these lil’ bites to spice up your snacking. Even the names sounds like a tumbling good time. And these Somersaults are a good time…in your mouth. The creation of natural foodies looking for a healthier snack option, these mini cookie-shaped nuggets taste like an indulgence but are packed with the nutritional goods. At 150 calories a serving, these nuggets have 6 to 7 grams of protein, 3 grams of fiber and are filled with tastiness. They’re surprisingly filling, too. I found that even half a serving was enough to take the edge off of my hunger and give me my salty craving fix. 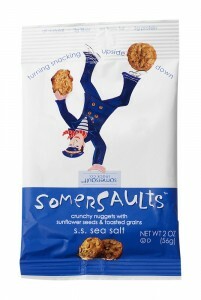 The Somersaults are baked with sunflower seeds and toasted grains; they basically taste like crunchy sunny-seed cookies. (I love sunflower seeds; I used to eat them until my lips were numb.) They come in sea salt, cocoa and salty pepper. I loved the sea salt flavor—it seemed like Somersaults at their simplest and best. The salty pepper did have a bit of a kick to it, which I liked, and the cocoa had a mellow chocolatey flavor. If you like sunflower seeds and crunchy snacks, check out their website and get a discount on the treats! 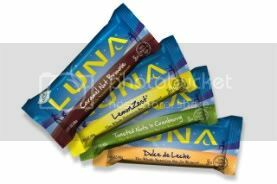 Now, Luna’s got a new recipe that has added Vitamin D to support calcium absorption and promote bone health. Good thing, too, because I saw a recent article on CNN that said a crazy 70 percent of American kids aren’t getting enough Vitamin D. Parents out there: Give your kids these FBG-approved bars. They’re less than 200 cals, have 3-5 grams of fiber and 8-9 grams of protein. PLUS: They’re yummy. I tried two new bars: Lemon Zest and Chocolate Peppermint. While I couldn’t taste the Vitamin D, I thought both bars were treats, so I promise you and your kids won’t know the difference. Lemon Zest is light and lemony, and Chocolate Peppermint Stick tastes like a splurge—a girl-scout-mint-cookie splurge. Don't forget vitamin D is available naturally from the sun. You can get it AND do fit fun things at the same time! Vitamin D has an interesting story, it isn't just another vitamin. If you do get vitamin D from food or a supplement, make sure it is D3, not D2. Yes Laura, I wanted to try these too. Even with the discount, the shipping costs about as much as the 8 oz package. It costs 8 dollars to ship 8.2 ounces! Sorry to complain. I didn't check the 2 oz package. I'll look for these in the store but thanks for featuring!